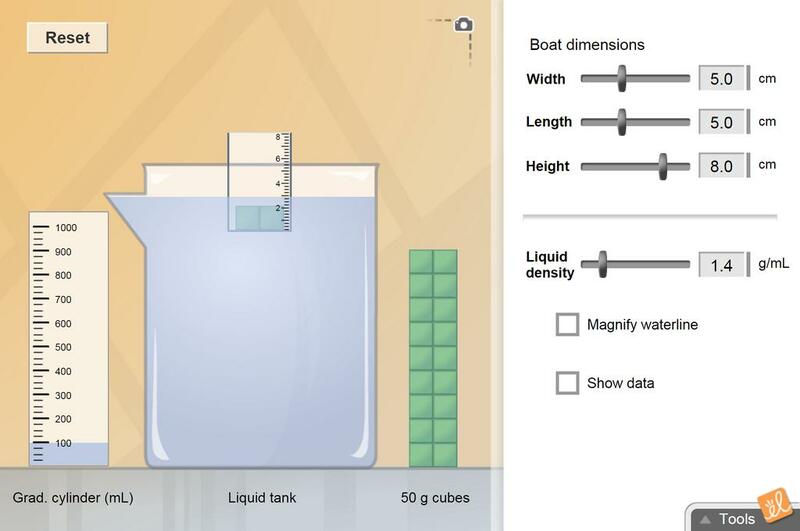 Place weights into a boat and see how far the boat sinks into a tank of liquid. The depth of the boat can be measured, as well as the amount of liquid displaced. The dimensions of the boat and the density of the liquid can be adjusted. See how much weight the boat can hold before it sinks to the bottom! The answer key supplied by explore learning did not show how some of the problems were figured out ... I ... (more)simply modified the key to show how to solve the extension problems. A French translation of the Student Exploration sheet in .doc format. A French translation of Mark Roxas's Inquiry Card. This inquiry card looks at how large ships can transport heavy cargo across the seas. It will help facili... (more)tate an investigation on how an object’s shape relates to its buoyancy which we refer to in Archimedes’ Principle.